The Government Development Bank for Puerto Rico (GDB) website is designed to offer visitors information about our role as a fiscal agent and financial advisor for the Commonwealth of Puerto Rico, and to offer details about the island’s credits and economy. Ever since the GDB was founded in 1942, the agency has played a key role in helping finance Puerto Rico’s economic infrastructure projects. A one of a kind institution, the GDB is in charge of developing financial strategies for the Commonwealth and all government agencies. 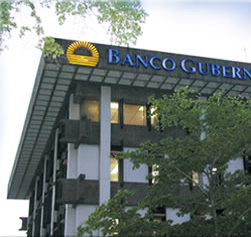 The GDB’s development and diversification is directly linked with Puerto Rico’s history and evolvement. Today, the GDB, its subsidiaries and affiliates, directly contribute with the financial structuring for infrastructure, housing, municipal, education and health related projects and helping develop job-creating industries in Puerto Rico. The GDB invites visitors to use this website as a tool to get to know the GDB and the agency’s efforts aimed to benefit the people of Puerto Rico.